View More In Game Accessories. 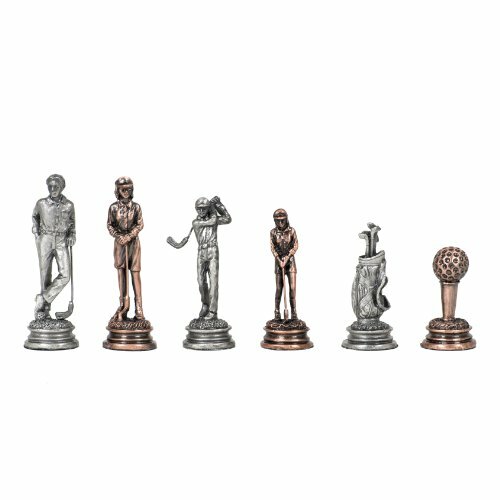 Time to tee up your chess game with this luxury golf theme set of chessmen! Inspired by the prestige of the beloved game of golf, this timeless choice features intricately detailed pewter pieces, perfect for any golf connoisseur. A gorgeous focal point of an executive desk or an accent piece for a family roomÉThese chessmen will be cherished for generations! Pieces collectively weigh 5 lbs. If you have any questions about this product by Wood Expressions, contact us by completing and submitting the form below. If you are looking for a specif part number, please include it with your message.